New MPNP Skilled Worker Overseas Stream: Express Entry Pathway and Human Capital Pathway - Gateway to Canada | Canada Immigration Consultancy! 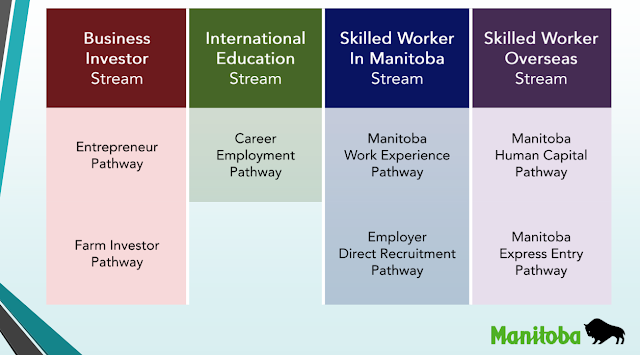 There are currently 4 major streams under the Manitoba Provincial Nominee Program. These are the Business Investor Stream, International Education Stream, Skilled Worker in Manitoba Stream and the renewed Skilled Worker Overseas Stream. There are two pathways under the renewed Skilled Worker Overseas Stream which took effect this month, January 2018. These are the Manitoba Express Entry Pathway and Human Capital Pathway. This stream is favorable for those with family or friends in Manitoba as well as those with previous post-secondary education completed in Manitoba within the past five years. In both of these Skilled Worker Overseas Stream Pathways, you need to have a work experience in Manitoba's In-Demand Occupations List. Listed occupations are all in the NOC 0, A and B. The MPNP In-demand Occupations list provides a regularly updated listing of which occupations qualify as ‘in-demand’ in Manitoba. If your occupation is regulated in Manitoba, you need to be registered in Manitoba in order to be eligible to apply under these pathways. There is no age cap for the Express Entry Pathway but for the Human Capital Pathway, the age cap is up to 45 years old only. If interested to apply, you may submit your Expression of Interest (EOI) here.